If there is one thing I would like to understand more of, it is Time. My understanding varies with my state of mind. On my best days I can see that Time is a mental construction, and not an aspect of Reality-as-it-really-is. But even that insight leaves me with many unanswered questions. How can it be?! Why am I trapped in this mental construction? And what made it? I guess this must be stupid questions for people with a clearer mind than I have, but I really don’t get it. And I do want to! I don’t think I am afraid of death. It is Life that I have problems with. Where is the contract that I signed to be here? I cannot remember that I signed such a contract. Terence McKenna used to say that it is presumptuous and preposterous that hairless primates should know the answers to everything. He could accept that Life is a mystery. But I am not very good at that. I think that since I am here without having asked for it, I have a right to know how things work. And on my list of mysteries Time is in the top. Please don’t send in comments to point me out that this is preposterous and presumptuous; several people have already done that. So far this associations with today’s song. 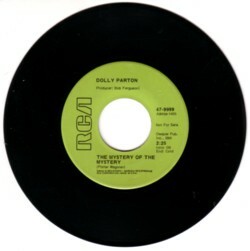 It is sleeveless 45 by Dolly Parton, with on one side the song The mystery of the mystery , written by Porter Wagoner. In the Soundtrack of my life this song should not be missing, even though it is musically a run-of-the-mill tearjerker.